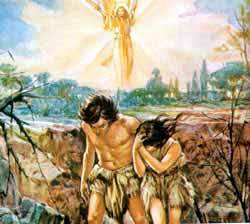 GOD HIMSELF MADEfor Adam and Eve their first earth-home. And a beautiful home it was. We shall call it a garden-home. God chose a place from which four rivers flowed and there he planted a large garden. We do not know the many kinds of trees and flowers and vegetables and grasses that he caused to grow in this garden. But we are sure that no park which man has made could be so lovely as was the Garden of Eden. In the midst of this garden God planted a wonderful tree, called the tree of, life. Whoever might eat of the fruit of this tree would live on and on forever. Adam and Eve were very happy. God had given them good things to enjoy, and they knew nothing about evil and wrong-doing. They often talked with God and listened to his voice as he walked and talked with them in the cool of evening time. This entry was posted in Discipleship and tagged Adam, Adam & Eve, Book of Genesis, Christ Jesus, Christianity, Eve, Garden of Eden, God, Jesus Christ, Sin, theology. Bookmark the permalink.